They gave it one heck of a try. 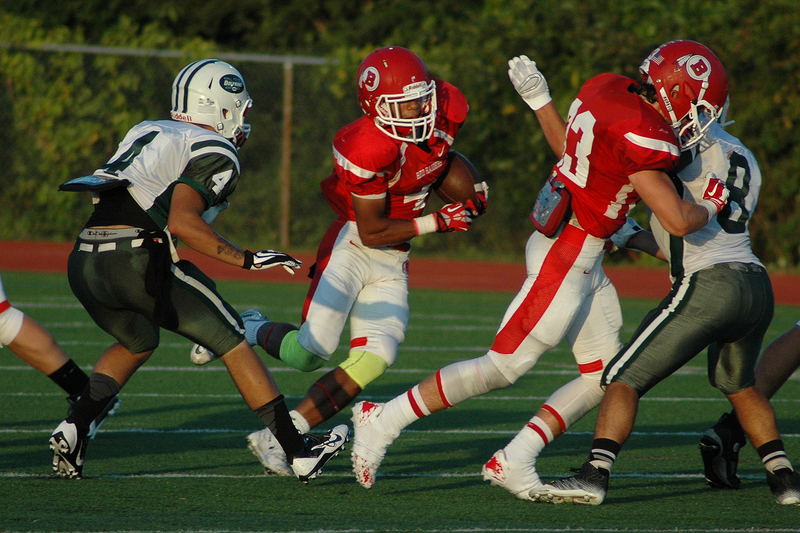 The Barnstable Red Raiders fell to the visiting Dennis-Yarmouth Dolphins Friday night (Sept. 5) before a fairly large crowd, 36-21, but they did have their chances. Twice, the home team in Red & White came within one score of tying the Dolphins only to watch their hopes and efforts fall to the wayside with a variety of miscues and tough breaks. Junior quarterback Griffin Burke turned things around after a rocky outset, going 8-22 for 174 yards and three touchdown passes, but an Andrew Jamiel 95-yard interception return for a touchdown took considerable wind from the Red Raiders’ sails in the early going. Two fumbles (DeMichael Johnson, Clyde Perry) also proved costly as the Dolphins recovered both times. Senior Bo Delaney was a considerable bright spot, making just three catches for 109 yards. DeMichael Johnson, also a senior, collected 127 yards rushing on 19 carries and linebacker Colton Bergal was exceptional on defense. All totalled, Bergal had 16 tackles on the night, including nine solo hits. Both Jack Kennedy and Owen Murray had key sacks for losses and played well throughout the night.